Mish's Global Economic Trend Analysis: Subprime Goes to College; Students Buried in Debt; Who is to Blame? Today, however, Ms. Munna, a 26-year-old graduate of New York University, has nearly $100,000 in student loan debt from her four years in college, and affording the full monthly payments would be a struggle. For much of the time since her 2005 graduation, she's been enrolled in night school, which allows her to defer loan payments. The Project on Student Debt, a research and advocacy organization in Oakland, Calif., used federal data to estimate that 206,000 people graduated from college (including many from for-profit universities) with more than $40,000 in student loan debt in that same period. That's a ninefold increase over the number of people in 1996, using 2008 dollars. When they applied for a third loan, however, Sallie Mae rejected the application, citing Cathryn's credit history. She had returned to college herself to finish her bachelor's degree and was also borrowing money. N.Y.U. suggested a federal Plus loan for parents, but that would have required immediate payments, something the mother couldn't afford. So before Cortney's junior year, N.Y.U. recommended that she apply for a private student loan on her own with Citibank. Over the course of the next two years, starting when she was still a teenager, she borrowed about $40,000 from Citibank without thinking much about how she would pay it back. How could her mother have let her run up that debt, and why didn't she try to make her daughter transfer to, say, the best school in the much cheaper state university system in New York? The balance on Cortney Munna's loans is about $97,000, including all of her federal loans and her private debt from Sallie Mae and Citibank. What are her options for digging out? Her mother can't help without selling her bed and breakfast, and then she'd have no home. She could take her daughter in, but there aren't good ways for her to earn a living in Alexandria Bay, in upstate New York. "I don't want to spend the rest of my life slaving away to pay for an education I got for four years and would happily give back," she said. "It feels wrong to me." Supposedly "Ms. Munna and her mother, Cathryn, have spent the years since her graduation trying to understand where they went wrong." It should take seconds. Going $100,000 in debt to get an interdisciplinary degree in religious and women's studies seem rather foolish to say the least. Exactly what kind of job did Ms. Munna expect to get with that degree? Now she is working for a photographer and it is plain to see her degree is totally useless. Ms. Munna and her mom should look in a mirror to see who to blame. Although Ms. Munna should blame herself, there is a huge enabler of these kind of tragedies: Pell Grants and government loans. 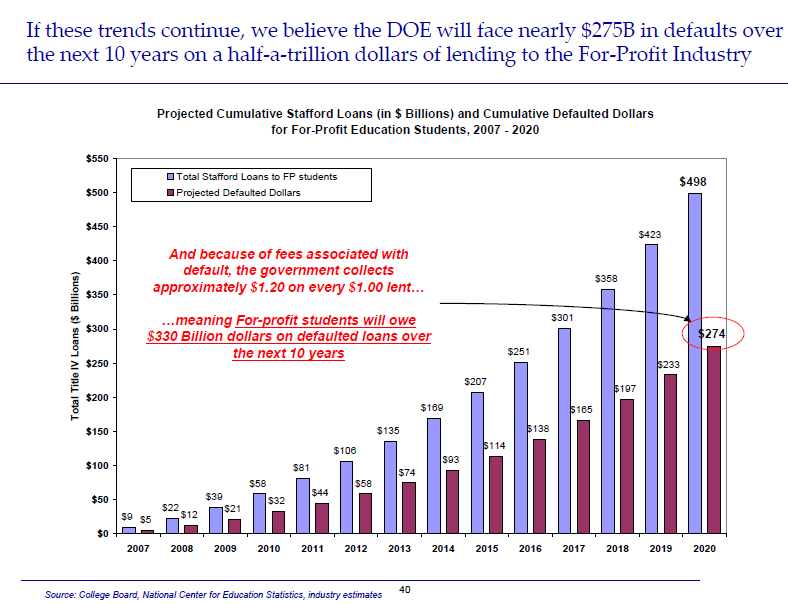 Inquiring minds are reading the Eisman ira sohn conference slides and speech-5-26-10 presentation called Subprime Goes to College. All to Maintain Access to Government Money. In many instances, for-profit institution’s representatives sit on the boards of their own Accrediting body, inevitably influencing the approval process and oversight of their own institutions! 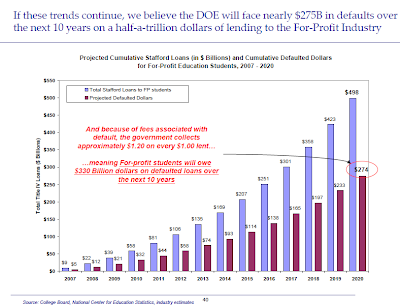 I have written about this many times before, most recently in For Profit Schools Turn Students Into Debt Zombies; It's Time To Kill The Entire Pell Grant Program. Rather than throwing hard earned taxpayer dollars at programs that invite fraud and make debt zombies out of students, it's time to kill the program entirely. Instead, Obama wants to expand the fraud, even indexing the fraud to inflation. Education is not the answer when the cost is $100,000 for totally useless degrees. Government meddling enabled this mess, and the best cure (although it will do nothing for Ms. Munna) is to shut off all student aid programs, offer more online programs at low cost, fire needless administrators, and get rid of bloated pension plans for teachers. Instead, Obama is compounding the failures of the disastrous Bush administration "No Child Left Behind" program. The president wants to throw still more money at the problem. This will do nothing but increase the profits at questionable schools, jack up the pay of administrators, and make more student debt zombies. The student vote turned out overwhelmingly for Obama and his policies are helping make them debt slaves for life.